“Engineering Recommendation from the NCTCOG” from the Sept 29, 2017 meeting with Collin County Elected Officials. We want to protect and keep “The GEM of Collin County”, Lake Lavon, the surrounding Blacklands areas, and communities of the lake. “YES!” TO EXPANDING AND MODERNIZING EXISTING MAJOR ROADS! “YES!” TO PROTECTING LAKE LAVON! NO HIGHWAY BRIDGE through the deepest and most used part of the lake! SAVE LAKE LAVON! “YES!” TO OUR LAKE ENVIRONMENT AND NEIGHBORHOODS! NO NEW BRIDGE CORRIDORS! With the growth of Collin County including many large subdivision planned for our area, improvements to our already over crowded roads are desperately needed. 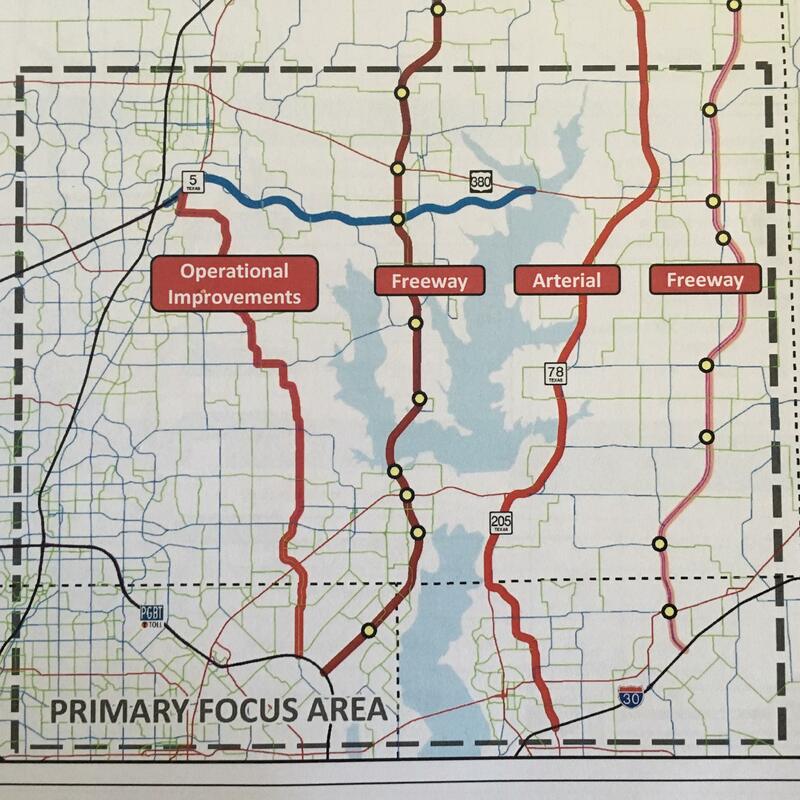 But, we can do that without an Interstate Highway style plan over the center Lake Lavon, through the lake’s peninsula and the area between Lake Lavon and Lake Ray Hubbard. AND, the November 2017 Updated NCTCOG Map (shown left) is proof that alternatives are available to both address transportation needs and retain the wholeness of Lake Lavon. Some History: In 2010 a group of thousands successfully stopped the bridge and route proposed then over Lake Lavon and through our Lake Community. They did it by uniting around protecting the lake and the area around the lake; the historic Blacklands, its environments, and the resources it provides to Collin County and the millions of people who visit this area each year from miles around. They did it by rallying to SAVE LAKE LAVON and STOP THE LAKE ROUTE. Fast forward to today, again we are called to teach and promote the value of Lake Lavon, the Blackland Lake Areas, and the Lake Communities… SAVE LAKE LAVON… NO 8-LANE, 150′ WIDE BRIDGE that will permanently change the lake. THIS IS A FOREVER DECISION… LET’S GET IT RIGHT! Unlike Cities in Collin County, Lake Lavon and the people who utilize it are not represented by a political or official governing body. Yes the CoE are custodians, but they are not regularly involved in local politics; and the CoE are often notified of plans for Lake Lavon long after the local entities have started the process. So, we must represent Lake Lavon to our elected officials and remind them why Lake Lavon and its shores are important and worth keeping whole. Unite behind the beauty of the lake; Unite behind the uniqueness of Lake Lavon in the DFW area, its wildlife, its fisheries, its water source, its tranquility… Unite behind these attributes that are worth protecting for generations of people to come. Help our elected official understand that WE LOVE LAKE LAVON just as it is. Lake Lavon is NOT just a water reservoir. It is a sanctuary set apart from the mundane and the go-go we experience elsewhere. We must show our elected officials what we all know, but sometimes take for granted… Lake Lavon and the Blacklands around it are unique and worth retaining. Here is the presentation from the NCTCOG_Collin_County_Strategic_Roadway_Plan_9-29-2017.